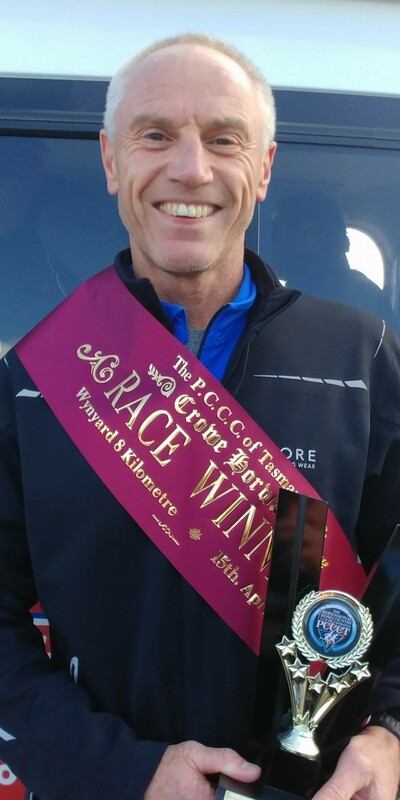 Members headed to Wynyard for Sunday’s race – the Crowe Horwath 8 kilometre handicap. The scenic course takes in tracks beside the Inglis River with a short, sharp climb to the lookout at Fossils Bluff. An excellent field of eighty two gathered in cool, windy conditions to listen to the starters’ orders. Dale Lancaster led the field away off the front mark of 6:40 but shortly into the race was overtaken by Karina Mason. Ron Chequer then led for a time bit it was soon clear that the race belonged to one of a group of in-form middlemarkers. Grant McCormack, Owen Thomas and Kyle Groenewege were the pre-race favourites and this confidence proved to be justified. Thomas looked likely to break his run of close misses until McCormack sailed by and proved uncatchable, to take out his first win with the club. Thomas hung on for second with Matthew Rolls and Andrew Bates running strongly in to the next two places with Groenewege fifth. Simon Gates, having his first run for the year ran a promising race to just sneak into the ten. McCormack put his great form down to the training he’s doing to participate in the Club’s marathon in a few weeks prior to running in the Melbourne Marathon in October. He had also trained to complete 50 kilometres of the Gone Nuts in March. Fastest male and female were Matthew Cunningham and Lyn Saint-John respectively. Earlier, nominated time winners were Louise Morse, Mackenzie Troughton, Kasey Taylor and Heath Bramich.